Is PS Vita Getting Kinect Face Tracking? 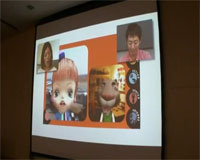 Sony recently revealed a tech demo which shows off the PS Vita's intuitive use of its camera, "Face Tracking" is a new feature which uses the PS Vita's camera to track points on the users face which then causes the on-screen avatars to basically replicate the users facial expressions. Though Kinect has similar technology which is designed to track points on your body, the PS Vita's can be used for something more. Just image using the tracking to replicate actions on Heavy Rain, imagine using the face tracking to capture some awesome facial expressions on Sackboy.